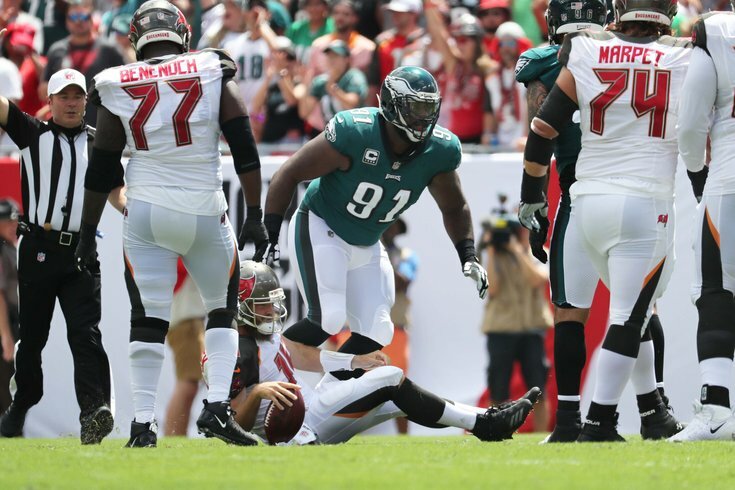 Philadelphia Eagles defensive end Fletcher Cox sacks Tampa Bay Buccaneers quarterback Ryan Fitzpatrick during the first quarter at Raymond James Stadium. For all of you who thought the Tampa Bay Buccaneers were a one-week wonder after their opening win — I'll count myself in that group — they served a rude awakening to the Eagles in the first half of Week Two. Despite a half that was quiet for long stretches for the home team, two long touchdowns have the Bucs nursing a 20-7 lead heading into halftime. Here's what I saw in the ugly first half of Sunday's game. • Philadelphia looked like a heaping hunk of garbage out of the gate, but at least one man came ready to play from the jump. Continuing a theme that started in preseason, Fletcher Cox came out looking like he wants to stake a claim on the Defensive Player of the Year award. After a pressure that forced Ryan Fitzpatrick to airmail a screen pass, Cox bulldozed through the heart of Tampa Bay's line on second down and gave the quarterback a nice taste of the turf. After giving up a huge touchdown to start the game, this was a much needed shot in the arm for the defense. That's why this man gets paid the big bucks. • All due respect to Donnie Jones, Super Bowl winner and Eagles legend, but Cameron Johnston has done an excellent job so far this season. One of the few guys on the team who already looks like he's firing on all cylinders. • Ronald Darby was the man who eventually came up with the interception, but major props to Rodney McLeod for the play he made to pop the ball up away from the reach of O.J. Howard. After giving up the long touchdown to Jackson to start the game, Philadelphia's defense locked in pretty much across the board. Coverage was tighter, penetration up front was constant, and there were very few opportunities for the Bucs to pick up big gains. Even as the offense shot itself in the foot, the defense continued to hold down the fort, and even erased some of the mistakes made by the guys on the other side of the ball. • The man sometimes known as Big Balls Doug had a decision to make late in the first half, with the Eagles facing a fourth and inches following their first sustained drive of the half. But it was hardly a decision at all — Pederson sent the offense right back out there, and they picked the first down up with ease. Just two plays later, Corey Clement went dashing into the endzone thanks to some tremendous blocking on the left side of the offensive line. Going for it on fourth down is not always going to work out for the Eagles, but they will benefit from this mentality for as long as Pederson is head coach. The added bonus of this excellent drive — it ate up a ton of clock and kept Tampa Bay's defense on the field for an extended period of time. In the Florida heat they're dealing with, that's a win for the Eagles. • Speaking of that drive, it wasn't the prettiest of stretches for Nick Foles, but the Eagles' quarterback made some crucial plays to extend it when they needed it. The standout play from the drive? This throw under duress from Foles on third and seven. If not for the sort of pressure you see Foles under here, he might have had a bigger and better half. He made an excellent throw to tight end Zach Ertz to bring Philly near field goal range late in the half, and continued to hang in the pocket despite taking a beating for the first 30 minutes of action. •If there's any game DeSean Jackson is going to get up for, it's a matchup against his former team. But even with the extra juice he brings to this matchup, there's absolutely no excuse to let him torch you for a huge touchdown on the first play from scrimmage. On some level, the Eagles should have been collectively prepared for the Bucs to take a shot deep to Jackson early — they watched their own offensive coordinators do it with him for years. And while Jalen Mills has made strides as a corner, he is woefully unequipped to keep up with the league's faster receivers in single coverage. Has to be more help for him there, or the Eagles need to seek out a different matchup. • Last week you could pin a lot of the Eagles' problems on Nick Foles and his unwillingness to throw the deep ball. The same has not held true so far in Week Two — Foles was clearly not at his sharpest, but the bigger problem was the lack of protection he was getting from the boys up front. There's a chicken or the egg dynamic here, of course. Foles ran the offense as if he constantly expected there to be more time to deliver the ball, and that's on him (and the coaching staff) to adjust once things started to take a turn for the worst. With Peters in and out of the lineup and the offensive line in flux, some more situational awareness was needed. That said, the protection was spotty at best, and Foles was having to step up and throw on the move far more often than a guy with his skillset should be asked to. This group needs to get on the same page, and soon, even if Carson Wentz's return looms in weeks to come. • File this under storylines to watch for later — Joshua Perkins was getting snaps and targets before Dallas Goedert, which seems very odd given how highly the Eagles think of the latter. With skill position guys dropping like flies, it's curious that the Eagles didn't take more advantage of having two pass-catching tight ends. • Bad as the Jackson touchdown to open the game was, there's a strong case to be made that the touchdown they gave up to Howard in the second quarter was worse. The Eagles were in a position to bring Howard down roughly 50 yards before he reached pay dirt, and Darby's sometimes horrendous tackling reared its head at the worst possible time. Good as he is in coverage, Darby better work on wrapping up if he thinks he's getting a big payday next offseason. • Just one man's opinion, but leaving Chris Godwin completely uncovered in the end zone was probably a mistake. • Right when you thought the Eagles could head into the half with some wind in their sails, Jake Elliott plunked a field goal attempt off the upright. Woof. • I would love to be able to comment one way or another on whether the Eagles deserved the healthy dose of penalties they were receiving in the first half, but for some reason the broadcast team at Fox decided it was a better idea for Kenny Albert and Ronde Barber to talk and speculate about the penalties without offering any visual evidence to their audience. So not only was it a slog to watch flags get thrown every other play, there was no way for anyone to determine whether they were deserved or not. Bang up job by all involved. • Philadelphia's sideline was a glorified MASH unit in the first half. Jason Peters was in and out of the game with what appeared to be cramps or dehydration (the Eagles officially said he had a quad issue), Jay Ajayi was sent back to the locker room with a back issue, and Mike Wallace had to be carted to the locker room after a catch he made was wiped off the board by a penalty. It was already going to be a tough afternoon at the office with temperatures soaring above 100 degrees in Tampa Bay. Losing some of the only healthy skill position guys you have left to start the game? Even worse.